Thousands of students opposing corporate-controlled media and political monopolies took to the streets in Mexico City. A coalition of thousands of mainly university students, unionized workers, and farmers in Mexico City have taken to the streets to demand greater freedom of speech and also to protest the possible return of power by the Institutional Revolutionary Party (PRI). The PRI is a member of the Socialist International, but don’t let the name fool you—the party is actually quite “centrist” (the term pundits usually use to describe center-right parties) in most of its policies. PRI’s main rival is the left-wing Party of the Democratic Revolution (PRD). 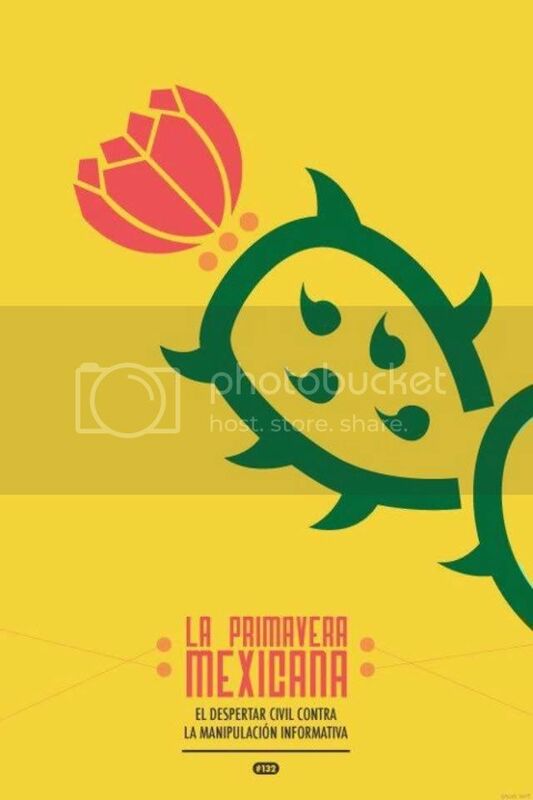 (Mexican Spring poster in solidarity with Occupy Wall Street, via @mexicoOWS). Dubbed the “Yo Soy 132” movement (Twitter users can follow protest updates by searching #YoSoy132), or the “Mexican Spring” by observers, this latest wave of protests marks the third large student demonstration in less than a week. The name “I Am 132” symbolizes the continuation of the original demonstration by 131 students during Peña Nieto’s visit to the Jesuit-run Ibero-American University (UIA). “Our main goal is to seek greater democracy within Mexican media,” said fellow activist, Rodrigo Serrano. The name, “YoSoy132” alludes to a group of students from the Universidad Iberamericana, who heckled PRI presidential candidate Enrique Peña Nieto during a recent visit to the university that chased him off the premises. After the incident, PRI leaders accused the Iberoamericana students of being intolerant, inconsiderate “stooges” paid to protest against Peña Nieto by the leftist PRD party. Students claim their heckling of Peña Nieto was a grassroots event, uninspired or funded by any political party. In particular, students have expressed frustration with the “monopolization” of Mexican politics and media. The example New America Media provides is a company named Televisa, which along with TV Azteca, controls 95 percent of Mexico’s TV market. Similarly, students believe PRI has a monopoly of sorts on Mexican politics. The party ruled for seven decades (1929-2000), but was defeated by the National Action Party (PAN) then, which has ruled for past 12 years. The PRI now has a very good shot of winning the July 1 elections. Furthermore, students see these two monopolistic forces as being in cahoots with one another. Documents obtained by Proceso magazine suggest Peña Nieto paid Televisa for favorable media coverage while he was governor of Mexico State. In his books and articles, which are being cited by Peña Nieto’s rivals, Villamil asserts that as governor, Peña Nieto gave millions to Televisa in advertising contracts to guarantee maximum exposure on the network’s programming, allegations the candidate rejects. Much like the Occupy movement, which operates outside the political system, the Yo Soy 132 movement has not yet called for students to throw their support behind the PRI’s rival party, PRD. 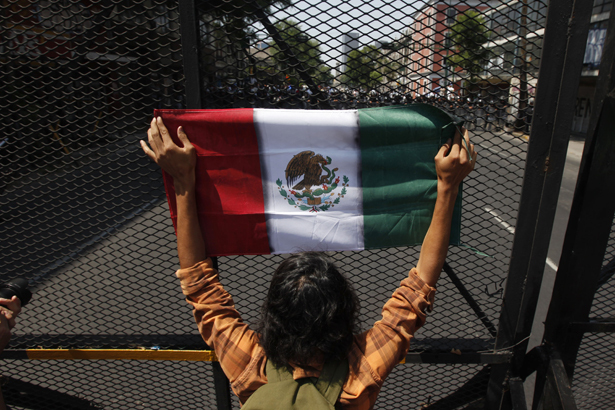 This reality has led some political analysts, such as Hector Faya, to claim Mexico City–oriented protests will have little impact on election outcomes. However, the protests could impact candidates’ political agendas. “I am not with any party, but I am sick of so much corruption,” said Eduardo Nolasco, a 22-year-old student. “We are fed up of so many lies and of the hypocrisy of Pena Nieto and the media,” added Isabel Leyva, a 53 year-old house wife who was accompanied by her daughter, a student. Police said there were more than 40,000 protesters at the demonstration. 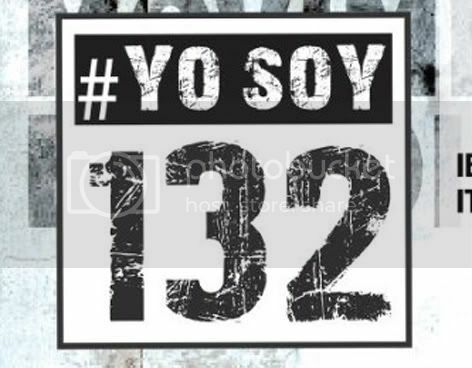 Yo Soy 132 might confuse some observers, just as Occupy baffled many witnesses, because it’s a general rejection of the status quo. That big, ambitious agenda of rejecting huge institutions such as corporate media could overwhelm many, which explains why the initial reaction to these kinds of movements is hostility and belittlement. Many may subconsciously feel it’s easier to mock than to join and fail, or be crushed by police.